The original Brynmawr Caving Club was formed in the 1950s by Brian Price. He had begun exploring the caves in the area in the 1940s, whilst still at school. 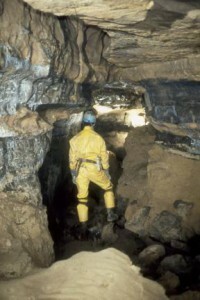 Later, and along with the some of the local scouts, he mapped the cave of Eglws Faen and discovered Ogof Agen Allwedd, the first major cave to be found in the Eastern part of the caving region of South Wales and which, after further exploration, was to become one of the largest cave systems in Britain. 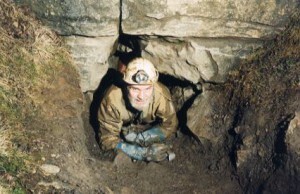 The club pursued many other explorations over the next few years, in the hope of uncovering more caves. This first Brynmawr Caving Club became defunct in the mid 1960s, although some of the scouts still carried on exploring caves. This included starting to clear a blocked entrance deep in the Clydach Gorge – it became known as Brynmawr Old Dig, a site the club has returned to on a number of subsequent occasions. A new Brynmawr Caving Club was founded in 1967 by Bill Gascoine, Steve Pedrazzoli, Pete Whetton, Colin Edmunds, Ken Jones, and John Coventry and is the club that exists today. For the first couple of years things were a bit ad hoc but from 1969 the new club really took off. Some of the scouts from the original club were still caving at this time and one of them is still associated with the present club, along with his son and grandson! Bill Gascoine became a long standing chairman of the club and assisted by club members, carried out many water tracing experiments over a period of many years. This large body of work, mapping the catchment areas for most of the major springs in South Wales, was to prove very important and informative and has, undoubtedly, lead to the discovery of many caves and kilometres of cave passage. Bill sadly passed away in 2012. Brynmawr Caving Club members have been involved in many important discoveries in South Wales from the 1970s to the present day. These include explorations and new finds in the major cave systems of Ogof Agen Allwedd, Ogof Craig A Ffynnon, Ogof Y Daren Cilau and Ogof Draenen, along with many smaller caves. In 1991, after many years of effort and the uncovering of a number of small cave fragments, the club discovered the major cave system of Ogof Carno, which has more than 9km of passages. This cave is almost unique, in that the entrance is situated 1.7km inside a man made tunnel – Carno Adit, to the North of Ebbw Vale. In 1994 the club took an interest in Crescent Cave, a minor cave, consisting of a single, small chamber. In 1996, after extensive work in clearing a route vertically downwards through boulders, the head of a shaft was revealed which led to a short but tall passage. Two further boulder blockages were cleared and in 1997 a series of shafts were revealed, leading to a complex system of passages and chambers on a number of different levels. Crescent Cave contains 700m of passages. It hasn’t all been about exploration, with sporting trips taking place across South Wales most weekends and also on midweek evenings. Regular trips to the other caving regions of the UK, such as the Yorkshire Dales, the Peak District and the Mendip Hills, have always been a feature and a number of the members have caved in other countries around the world. Some of these trips abroad have been caving holidays, where sporting trips are undertaken in classic caves. Others are full scale expeditions, where the aim is to make new discoveries. Brynmawr Caving Club members have also taken a very active role in cave rescue over the years, with people serving as team members, officers and rescue wardens. The Club has held it’s meetings at a number of different pubs in the area, including the Drum and Monkey in Blackrock in the Clydach Gorge, the Gwesty Bach in Brynmawr and, it’s home since 1997, The Hobby Horse in Greenland Road, Brynmawr. Brynmawr Caving Club has published a number of journals, containing interesting and informative articles written by its members. While numbers have varied over the years, the membership currently stands at 20+. The Club has always had an active social side, with Christmas dos and barbeques, along with special events to mark important anniversaries. Brynmawr Caving Club is still as active as ever and its members will be caving for many years to come.